The Cayenne and the Panamera have been lining Porsche’s coffers for years, but the 911 remains now and forever the brand’s heart and soul. Their Motorsport Centre in Weissach is overrun with versions vying to become the eighth generation of this legendary sports car that will be unveiled at the next Frankfurt Auto Show in September. Of course, this won’t stop Porsche from launching the latest variations of the previous generation a few months beforehand. And we’re not talking scraps here... Like a good fireworks show that rallies for a spectacular finale, Porsche is putting the cherry on top of the seventh generation of the 911 Series Carrera GTS, unveiled in coupe and cabriolet at the last Paris Motor Show. We drove the first GTSs a few months ago, under the California sun on the roads around Palm Springs. They are distinguished by the body they share with the Carrera 4, which is as wide as the Turbo’s. The GTS comes in a more powerful version with the six-cylinder naturally-aspirated flat engine that equips the Carrera S.
Following that first test drive, Porsche introduced the two “Black Editions,” which are essentially almost completely black versions of the most reasonable 911, equipped with the 3.4-litre 345-horsepower version of the model’s go-to six cylinder flat engine. Next it was the Carrera 4 GTS coupe and cabriolet’s turn. 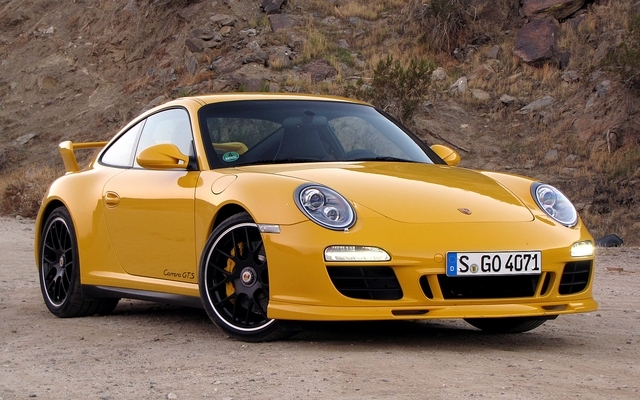 Those were simply all-wheel drive versions of the GTS’s test driven in California. And that’s not all. The Germans also unveiled the 911 GT3 RS, of which only 600 units are available worldwide. Designed for the racetrack, this RS is equipped with the biggest six-cylinder boxer engine ever installed at that Zuffenhausen plant. This 4.0-litre naturally-aspirated engine produces a mere 125 horses per litre thanks to forged pistons, titanium connecting rods and a crankshaft borrowed from the competition GT3 RSR. The math is elementary: it produces 500 horses at 8,250 rpm and 339 lbs-ft of torque at 5,750 rpm. That brings the total number of models to a whopping twenty-three. At the top end, there’s still the GT2 RS whose turbocharged engine produces 620-hp and with a base price of $279,500. And next September, they’re scrapping everything and starting from scratch for the start of the car show season in Frankfurt. Who’s going to complain? The next 911 will be a little longer, a little wider and definitely more powerful and fuel efficient. All four variations of the 911 Carrera GTS share the same 3.8-litre engine that we first discovered on the Carrera S but also on the Speedster, whose production, in a nod to the legendary Porsche 356 of the 1950s, was limited to just 356 units. They have long since all sold out, but Porsche still shows it on its web site at a price of $232,800. All of the GTS models have a variable resonance intake manifold. Its maximum power of 408 horses is delivered at 7,300 rpm, compared to the 385 horses at 6,500 rpm for the “S”. There’s 236 lbs-ft of torque beginning at 1,500 rpm, an increase of 6%. It has an identical peak of 310 lbs-ft, but achieved at 4,200 rpm rather than 4,400 rpm. The GT3 features a sharper version of this engine that produces 435 hp. Porsche tells us that the GTS coupe goes from 0-100 km/hr in 4.6 seconds with the manual gearbox and 4.2 seconds with the PDK and the Sport Chrono Package’s Launch Control ($1,100). With its 95 additional kilos, the Cabriolet adds two tenths of a second in both cases. Basically, that’s a second more than a Turbo for the Coupe. Under the GTS’s larger fenders, it has the same 235/35 ZR 19-size tires in front as the Carrera S, but the track is 2 mm wider, like with the Turbo that has the same ones. In back, however, there are 305/35 ZR 19 tires instead of the 295/30 ZR 19 used on the “S”. 32 mm have been added to the track width and the roll bar has a larger diameter. The factory standard black wheels with central mounting bolt are inspired by those of the RS Spyder race car. They are optional on the Turbo and standard on the Turbo S.
The sport version of the GTS coupe can also be equipped with a standard PASM adjustable suspension, firmer shock absorber settings, a body that’s 20 mm lower and a mechanical limited-slip differential also offered separately on option. The cost is $1,090 in both cases. The GTS is recognized by the increased presence of the front end and black rocker panels and exhaust tips. It bears a stronger resemblance to the Turbo if you spend the $4,160 for the optional Aero Package, which adds a more pronounced front spoiler and a rear spoiler, while subtracting the Carrera GTS inscription on rocker panels. Inside, Alcantara suede abounds, including on the steering wheel rim. The GTS coupe is 5 kilos lighter despite the increased size and the large rear wheels because the back seats have been eliminated, but there’s no charge to put them back. You can also change the interior finish with the “Carbon” or “Aluminum” Packages for $5,630 and $3,280 respectively. From the first test drive in California of a GTS Cabriolet, the increased torque at medium speed is obvious. It’s a joy to drive in town, especially with the smooth, light and precise control of the manual transmission, undoubtedly aided by the optional ($880) short-throw sport shifter. The high brake pedal requires some getting used to for the heel-toe technique as is often the case in a 911. The body is rigid and the ride is very comfortable on frost-free roads. The balance is excellent and the Cabriolet is a stand-out in turns. The soft top comes down in only 16 seconds in the GTS looks a lot like the Speedster, especially from the back. The driving position is still impeccable but a little too low in the second GTS we test drove, a spectacular yellow coupe equipped with optional partially adjustable sport seats in a carbon fibre shell. It was also equipped with the Aero Package, the sport suspension and the PDK automatic dual-clutch gearbox, on option for $4,930. The ride is noisier and firmer than in the Cabriolet. When prodded, the GTS’s engine seems more linear than that of the Turbo but obviously doesn’t pack the same punch. The PDK’s seven speeds shift cleanly, especially with the large shifters on the new sport steering wheel, but it won’t make you forget the pleasant and direct manual, particularly in light of the fraction of a second too long that it takes the PDK downshift to the lower gear. The GTS coupe is particularly impressive on the way down to Borrego Springs, in full Sport mode and at breakneck speed. It devours the quick succession of turns. Be it hairpins, long turns or zigzags, nothing fazes it. You’ll have to push extremely hard in a sharp bend to hear a small squeak in the front wheels. This car’s limits are best tested on a track, and the same goes for the brakes, which are irreproachable on the road. The only justification for spending the extra $9,300 on ceramic brakes is if you’re going to drive it on a race track. Sure, the 911 GTS isn’t as relentless and voracious as a 911 Turbo, but it’s a lot less expensive in front-wheel drive, with a base price of $104,900. It’s less radical, sharp and specialized as a GT3 and even less than a GT3 RS, of course. By playing with the options, namely the Aero Package, you can create a 911 that looks a lot like what you’d get if you crossed a Turbo and a GT3. Same goes for the ride in many ways. The GTS is a little more high-performance than its other sisters with naturally-aspirated engines and improved handling and roadholding. It’s aimed at those looking for this very precise amalgam of features with a unique look. It finds its clientele like a heat seeking missile. It’s a strategy that seems to work rather well at Porsche. And if your spouse, partner or bank manager tries to stop you, tell them that the renowned analysts at J.D. Power and Associates judged the Porsche 911 the most reliable car on the continent after three years, all categories combined. One never knows. The 911 comes, and goes, quickly.